Arsenopyrite, Iron arsenic sulphide, FeAsS. 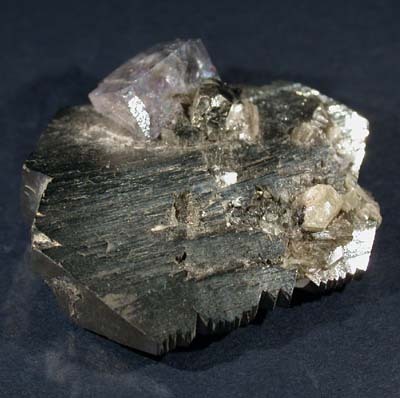 Arsenopyrite is the most common arsenic mineral and the principal arsenic ore. It occurs in high temperature, hydrothermal quartz veins, sometimes in association with gold. The mineral is widespread. The specimen shown in the picture comes from Hunan Province, China and has a lovely, pale lavender, transparent 10mm cube of Fluorite on its upper surface.